Costanzo graduated from the New York Restaurant School and worked in many area restaurants including Baang, Long Ridge Tavern, and Quattro Pazzi (Executive Chef). Hyland is a graduate of the Chef’s Training Program at The Natural Gourmet Institute for Health and Culinary Arts. The duo brings their passion and energy to create an eclectic and inviting menu and environment to their dream restaurant. When I asked them what attracted them to this location, Hyland told me “When we first saw the location… we fell in love with the layout and the fact that the open kitchen made the space so inviting and intimate.”The fifty seat interior was completely redecorated and the result is an inviting space that is divided into two dining areas with marble topped tables separated by a long marble bar overlooking the kitchen. Exposed beams under the skylight add charm to the minimalist style of the space. The menu offers a diverse selection of pastas, meats, fish, and poultry with a strong Columbian influence from Costanzo’s wife, Mayte. Costanzo’s talent was immediately apparent when I visited Olio one afternoon for lunch. The roasted and shredded pork Torta (Mexican variety) with avocado, Chipotle mayonnaise, roasted tomato and arugula, served on a Ciabatta roll was impressive. The slow roasted pork was delicious, moist, and flavorful and the peppery arugula and the sweet, roasted tomato perfectly complemented the pork. The mayonnaise brought just a touch of spiciness. This was my first taste of Costanzo’s culinary talent and the reason that I returned to Olio for the other dishes. My favorite appetizer was the BBQ Spareribs. 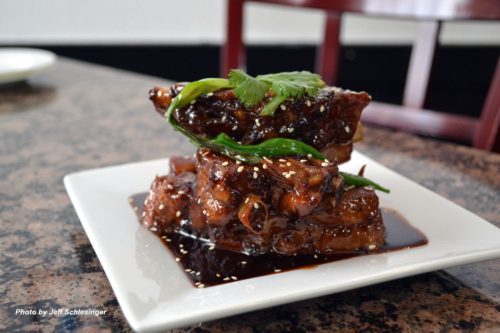 The ribs were first braised for almost two hours and when they emerged from the moist braising process, they were finished with the miso soy BBQ sauce that was comprised of raisins, star anise, and plum wine. The “tower” included five ribs that were fall off the bone tender, full of flavor and smothered in Costanzo’s sweet and succulent BBQ sauce (extra napkins required). The dish was garnished with sesame seeds and charred green onions. Another delicious option was the Wild Mushroom Crostini. Costanzo’ recipe began with a duxelle of cremini and shitake mushrooms to which he added diced caramelized cippolini onions and roasted garlic. When assembled he melted a small amount of Taleggio cheese on top. Presented as a trio with the arugula and a touch of truffle oil, this dish presented great flavors and was a delightful way to begin the meal. The Seared Sea Scallops served atop a smoked cauliflower fondue and complemented with sweet and sour golden raisins was another excellent choice. 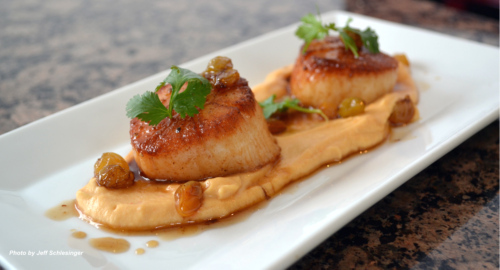 The two large scallops were perfectly seared and Costanzo added Sherry vinegar to offset the sweetness of the raisins. If, like me, you prefer a little more saltiness to your dish, be prepared to add just a little salt to the cauliflower fondant to bring out more of the cauliflower’s natural goodness. 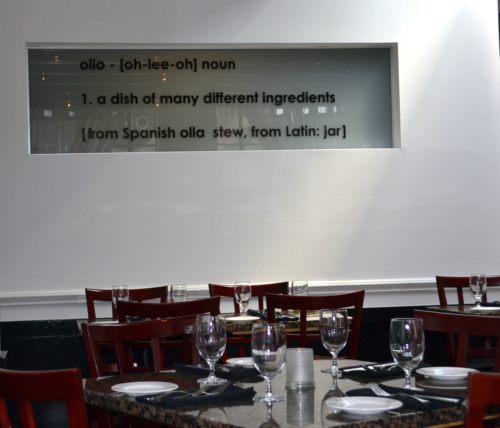 Olio’s entrées feature house made pastas, fish, and several items that Costanzo slow roasts and braises. The House-Made Ricotta Gnocchi, served with lobster and finished in a brandy cream sauce was my favorite entrée. The gnocchi were delicious, with a light, soft texture; the lobster was perfectly cooked and Costanzo added a few sweet grape tomatoes to bring the various flavors together. 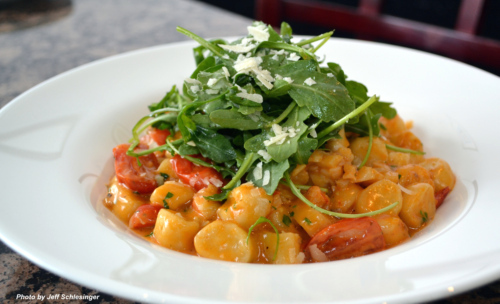 This gnocchi dish created a great combination of flavors with the creaminess of the sauce and the delicate texture and flavor of the lobster meat and grape tomatoes. 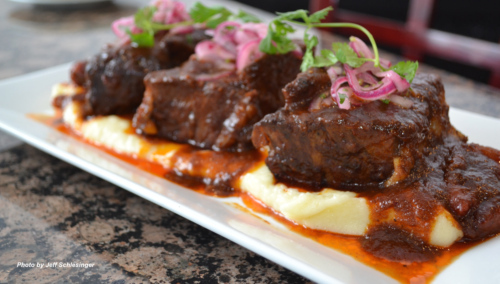 Another excellent choice was the Beef Short Ribs with truffle mashed potatoes that were served with an Ancho chili and tomato confit. The sauce exploded with flavors and the ribs were braised until they were fork tender while maintaining their integrity. The sauce’s flavor was enhanced by Costanzo’s braising stock which included plum tomatoes, veal stock, red wine, roasted red and Poblano pepper plus a touch of cinnamon. Overall this dish delivered outstanding flavors throughout. 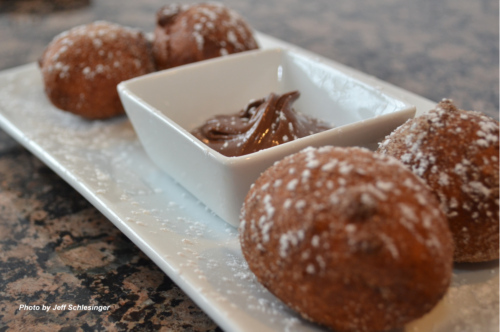 Please save room for Costanzo and Hyland’ special dessert, the Cinnamon Sugar Dusted Donuts, served with a Nutella dipping sauce. The donuts were some of the moistest versions I have tasted and when I asked the chef the secret to this incredible texture, he reluctantly told me, “ricotta.” No longer a secret ingredient and no longer a secret dish, I expect that the donuts will become a staple at Olio with every-changing sauce accompaniments being offered in addition to the Nutella. Other desserts were available to satisfy the sweet tooth. The bread pudding with a bourbon crème Anglaise sauce was a very good version, but I would have preferred a little more cinnamon and sauce and the warm almond fudge torte with Grand Marnier served with house-made vanilla bean ice cream and raspberries, was more a brownie in texture, but very tasty. This entry was posted in Stamford and tagged Jeff Schlesinger, jfood, olio, Stamford by jfoodeats. Bookmark the permalink.